Enugu - The New Haven zone of the Indigenous People of Biafra (IPOB), Enugu state chapter under the leadership of Mazi Nnamdi Kanu on Sunday, celebrated victory over the machinations of the enemies of Biafra and the fulfilment of the prophesy of its leader, Nnamdi Kanu over the rigging of elections in Nigeria. Moreso, that the time for Biafra restoration is near was clearly seen following the recent invitation of the Mazi Uche Okafor-Mefor-led IPOB leadership at the United Nations office in Geneva, Switzerland which was a landmark achievement since the beginning of Biafra independence struggle. And for the members of the zone, this shows that the quest for Biafra nationhood is widely recognised and has come to stay. In his opening remarks, the New Haven zonal coordinator, Mr Nku Joseph stated that the IPOB family is crossing the Rubicon to the other side of the struggle and therefore, “we must cross with one spirit and one mind with the spirit of forgiveness and togetherness with all our collective effort which is needed for the complete restoration of Biafra. Earlier, the meeting started with prayers and thanksgiving songs in recognition to God Almighty who made the gathering possible and given IPOB victory over the enemies and with the assurance that the struggle would continue to move from a point of strength to another. Members of the zone who spoke to our correspondent pointed out that the present political state of Nigeria shows that the Permanent Voters Cards, PVCs, and elections in Nigeria was a total waste of time with what recently played out in Ekiti and Osun states. They added that to boycott all forms of election is the only way forward and that people are now beginning to understand why the IPOB leader who earlier called for election boycott in a country where transparency and the rule of law is neglected. 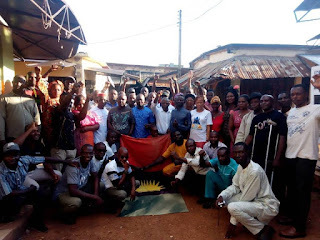 The IPOB New Haven zone under the leadership of Mr Nku, from Cross River state, have shown transparency and honesty in all its affairs and the family love which the coordinator has brought upon the zone has encouraged her to triumph over situations despite many challenges that has befallen the struggle in the state.